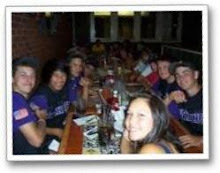 We're working to set up a home for the Lake Stevens Vikings on Blogger to highlight and post photos, video, slideshows and news updates during the upcoming 2009 Baseball Season. We've added a feature from odiogo.com to the teams spot here on blogger. Directly below the blog post title you'll find a listen now button. Click on the listen now button to enjoy a podcast provided by odiogo.com. Odiogo.com allows you to get your news on the go and offers a break on the eyes while having the web read to you. We invite Viking team members and their families to share season baseball links, photos and news with us on the team blog. Help spread the word by passing along the new link to the Lake Stevens Baseball fan site and be sure to subscribe. See you on the field in 2009. Nothing but blue skies overhead in Spokane Washington when the Lake Stevens Vikings took the field looking crisp even through a distant camera lens. The announcer led the baseball squads and their fans in a pre game ceremony concluding with a "hats off" National Anthem before sending them off to slide around the bases. Lake Stevens Vikings are in the sports headlines all over the state finishing the season by taking a Championship Award and the State Title home. Check out some of the Western and Eastern Washington press about the 2008 State Championship team and don’t miss their A L B e teamz website. Enterprise Newspapers, Vault Sports Illustrated – a CNN Network Site, Go skagit.com, District News , Aol Video , YouTube Video, and Other News sites. Read about Lake Stevens Vikings in Eastern Washington press at: The Spokesman Review, Spokane ALB and here's a link to the State Finals.